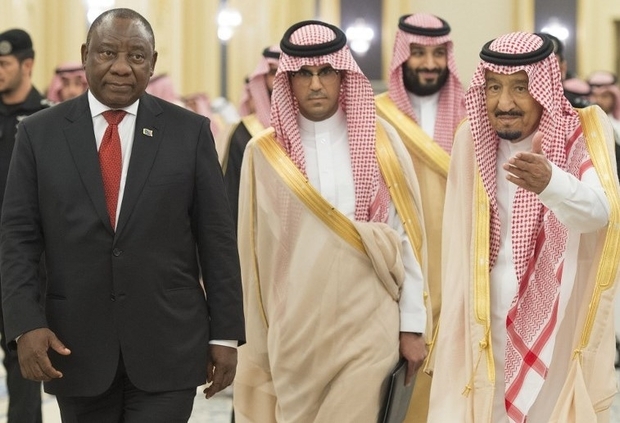 As South African President Cyril Ramaphosa concluded visits this month to the Kingdom of Saudi Arabia and the United Arab Emirates, securing $10bn worth of investment from each country, questions arise as to what price tag is attached to these investments. South Africa’s arms exports to both Gulf countries have grown since the begining of the war in Yemen, making it potentially complicit in war crimes committed by the two countries in Yemen since 2015. For three years, the war in poverty-stricken Yemen has continued unabated since Houthi rebels took control of Sanaa and began to move southwards towards Aden. A coalition of Arab and Muslim states, led by Saudi Arabia, launched a military campaign aimed at defeating the Houthis. The Saudi-led campaign exacerbated the humanitarian impact of the war through intense aerial bombardments, causing mass civilian casualties. Saudi control of ports of entry and exit has hindered the delivery of food and basic necessities; creating what has been deemed the world’s largest humanitarian catastrophe. Medicins Sans Frontieres (Doctors Without Borders/MSF) recently reported that outbreaks of diseases such as cholera and diphtheria and an upsurge in fighting has worsened the dire humanitarian situation, where more than three million people have been displaced since the war began. It is estimated that over 20 million people need humanitarian assistance. MSF further indicates that indiscriminate bombing and chronic shortages of supplies and staff have led to the closure of more than half of Yemen’s health facilities. Human Rights Watch accounts that “the armed conflict has taken a terrible toll on the civilian population. The United Nations High Commissioner for Human Rights estimated that Saudi-led coalition air strikes may be responsible for approximately two-thirds of reported civilian deaths. According to the South African National Conventional Arms Control Committee (NCACC) annual reports, in 2016 and 2017, South Africa supplied arms, ammunition and armoured vehicles, as well as surveillance and military technology to both Saudi Arabia and the UAE, amounting to more than three billion rands (almost $228m) whilst the two countries were deeply embroiled in a conflict of devastating humanitarian consequences. Clear evidence of South African military equipment being used in Yemen by the coalition emerged as early as 2015 when footage was broadcast by Al Masirah news channel, a pro-Houthi outlet, depicting a Seeker II drone that was shot down. The images of the crashed drone clearly indicated a plate worded: “Made in South Africa Carl Zeiss Optronics Pty Ltd”. The Stockholm International Peace Research Institute (SIPRI), which documents the flow of arms worldwide, noted that arms sales to the Middle East increased exponentially between 2013 and 2017. Saudi Arabia stands as the most prolific buyer in the region, followed closely by the UAE, which has become the world’s fourth-largest arms importer. South Africa ranks amongst the top arms suppliers to the UAE for the period 2007-2017. Despite glaring concerns from a human rights perspective, arms supplying countries including South Africa continue to export weapons to the Saudi-led coalition. South Africa’s National Conventional Arms Control Act No 41 of 2002 states that the NCACC must “avoid transfers of conventional arms to governments that systematically violate or suppress human rights and fundamental freedoms;” and “avoid transfers of conventional weapons that are likely to contribute to the escalation of regional military conflicts, endanger peace by introducing destabilising military capabilities into a region or otherwise contribute to regional instability”. South Africa is signatory to the Arms Trade Treaty, which it ratified in 2014. As such it has committed to the conditions of the treaty, which stipulate among other things that the state parties assess the potential that the conventional arms could be used to commit serious violations of international human rights and humanitarian law. South Africa has continued to authorise the sale of conventional weapons that have been used by the UAE and Saudi Arabia in Yemen, despite allegations of serious violations of international law by members of the Saudi-led coalition. According to a report published by the New York Times in March 2018, Saudi officials claim to have carried out more than 145,000 missions over Yemen since the coalition’s involvement. Lynn Maalouf of Amnesty International has stated that “there is no reasonable explanation by states such as the US and the UK that would justify their continued support and irresponsible arms flows to the Saudi Arabia-led coalition, when there is extensive evidence that these have resulted in enormous harm to Yemenis for the past three years”. In addition to the sale of weapons, assault rifles, heavy artillery guns and armoured vehicles, South Africa has supplied both the UAE and Saudi Arabia with mortar bombs, armoured personnel carriers, artillery, ammunition, electronic attack systems and software, amongst a range of other controlled products. In 2016 when the Obama administration declined Saudi Arabia’s request for the supply of Predator drones, the kingdom turned to South Africa’s Denel Dynamics to assist Riyadh in the development of its own armed unmanned aerial vehicle (UAV) programme. Denel adapted the Seeker-400 with a range of 160 miles and an endurance of 16 hours to carry the Makopa air-to-ground missile and the Impi laser-guided missile, which has a multipurpose warhead suited for assassination missions. By May 2017, the kingdom unveiled its own combat drone, Saqr 1, which resembled Denel’s design. Saqr 1 is equipped with a satellite data link that enables long-range missiles and infrared opticals that allow for night-targeting. In June 2016, former president Jacob Zuma travelled to Saudi Arabia to inaugurate the Al-Kharj (Military Industries Corporation) facility in Riyadh, together with the Saudi Crown Prince Mohammed bin Salman (MBS), who is largely seen as the architect of the war in Yemen. The $240m projectiles factory was built in collaboration with South Africa’s Rheinmetall Denel Munitions and is expected to produce a minimum of 300 artillery shells or 600 mortar projectiles per day, as well as aircraft bombs ranging from 500lb-2000lb. MBS has consolidated power in the rooting out of dissidents within the ruling family and in seizing control of key ministries, including defence. With Saudi Arabia already holding the title of the world’s second largest arms purchaser, the kingdom has plans to grow its arms industry and manufacturing capabilities by 2030 through a newly founded state-owned company, Saudi Arabian Military Industries (SAMI). In 2018, notorious South African arms dealer, Ivor Ichikowitz, announced that his Paramount Group is in talks with Saudi Arabia with a view to transferring technology and establishing production plants. Since Saudi Arabia and the UAE are not signatories to the Convention on Cluster Munitions, the risk arises that South African companies may end up helping these countries to establish munitions factories that are capable of manufacturing cluster munitions. Both Gulf states have used cluster munitions in the war in Yemen. While Saudi Arabia boldly stands as a major arms importer, the UAE has quietly built a formidable military, using its oil wealth to purchase arms from, among others, South Africa. It is well documented that the UAE has contracted private military security companies linked to Blackwater’s founder Erik Prince to develop a new model army with a strictly “no-Muslim” hiring policy. Research by the New York Times revealed that this force consists of foreign troops, trained by Western veterans and that several South African mercenaries are employed in these private militaries in violation of the Regulation of Foreign Military Assistance Act. DefenceWeb reports that between 2006-2016 Denel supplied an estimated 192 Nyala (rebranded as Agrab in the UAE) armoured mortar carriers to the UAE through a local company, International Golden Group. Another significant deal was the sale of Al-Tariq (known as Umbani in South Africa) guided bombs for Mirage jets, produced by Tawazun Dynamics, a joint venture with Denel. This deal, estimated to be valued at $500m, ensured the delivery of at least 1600 bombs to the UAE by the end of 2016. After their failure to procure Predator drones from the USA, the Emiratis acquired Chinese manufactured drones that have been equipped with South African targeting equipment. At the Dubai Airshow in 2017, it was announced that the UAE has ordered 180 million Rands worth of surveillance drones from Denel, to be delivered in 2018. The UAE has a reputation for redirecting and re-exporting weapons to other countries (including African states) in clear contradiction of the Arms Trade Treaty. If South Africa is aware of any such onward sales, it would be in violation of local and international laws. As proxy wars are played out between Iran and the Saudi-led coalition in Syria and Yemen at the expense of innocent civilians, South Africa is joining the list of major arms suppliers that are fuelling these devastating conflicts. Widespread debate about arms transfers from the UK, Europe and the USA has erupted in those countries, considering the human rights atrocities committed in these conflicts. Germany and Norway have halted the sale of arms to countries involved in the war in Yemen, citing grave concerns over the humanitarian crisis. South Africa must ponder carefully its role in further destabilising a region that is already fraught with conflict through arms exports in a bid to boost economic development. The intrinsic values of the right to life and human dignity cannot be forsaken in favour of filling coffers, while blood continues to be spilled. South Africa recently applied to the United Nations for authorisation on a sale of 1.5 billion Rands worth of Umkhonto surface-to-air missiles to Iran. Former president Zuma engaged in talks with Qatar on the sale of majority shares of Denel in late 2017. These discussions may have extended into the Ramaphosa term. Both these intended moves may render South Africa culpable in the deaths of innocent people, the implications of which are far-reaching well beyond the Gulf region and would have a direct impact on international stability. – Zeenat Adam is a former diplomat and an independent international relations strategist based in Johannesburg, South Africa.